At the heart of every restaurant point of sale system is its ability to help serve customers. Point of Success’ customizable order entry menu makes ordering easier! Some other point of sale systems’ menus are so difficult to design that the job requires a technician. With Point of Success, menu design is as easy as placing buttons on the screen and setting the product code they activate. Menu design is even easier with the available training CD. When menus are scheduled to change, the changes can be made and stored in an inactive area of the menu designer, then added to the active menu with a few mouse clicks. Temporary or seasonal menu changes are almost automatic! on the menu and organize the menu to fit your way of doing business. The only limit to the number of buttons on a screen is the size of the computer display. 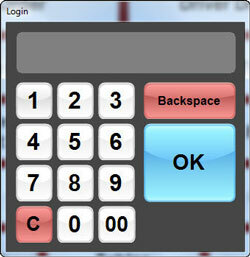 Buttons can be sized, colored and located anywhere on the screen. Touch screen computer displays are more affordable than ever. Touching a few buttons on the order entry screen is the fastest and most natural way to enter an order. If you’d rather use a keyboard and mouse, Point of Success supports those, too. With some other POS systems it’s hard to figure out where you are and how you got there. Menu navigation in Point of Success is streamlined to make order entry faster and more efficient. Serving customers takes less time and payroll costs are reduced. Because of these differences, it is rare that a general-purpose restaurant POS system can handle pizza ordering. 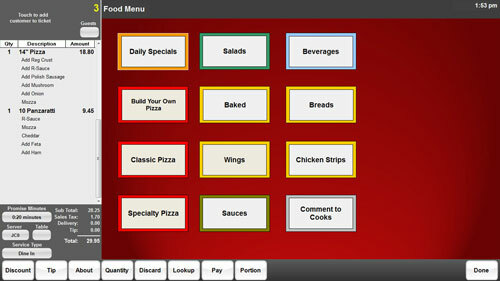 Point of Success addresses pizza ordering with its one screen pizza ordering window, also called a super button. On this super button can be seen combination pizza selections on the left, sauce selections at the top, followed by cheese and topping selections. The location and makeup of these buttons can be changed to suit a restaurant’s needs. Selecting a specialty pizza also depresses the buttons for included topping and sauce selections, toppings can be split between halves, thirds and quarters, topping portions can be multiplied, and the size can be changed if a customer changes their mind in mid-order. Closing the super button calculates the price based on the settings made in the program and places the item on the order. Whether a restaurant includes a retail area, a gift shop, or it packages and sells its specialty items, Point of Success can help! Point of Success has the ability to set a lookup code for products, then scan a bar code or key in the lookup code to add the product to an order . Existing UPC bar codes on packages can be used, or a restaurant can print and attach their own bar code to a product. And almost any other type of discount you can dream up! Find a current discount or coupon offer in the list or look one up with a code. Select the discount to use, select the items to which the discount applies, then Point of Success automatically calculates the discounted price. Point of Success can prohibit item price changes and deletion of saved order items. Managers can override these controls to change prices on order items and adjust tickets with an audit file tracking every discount. Prevention of unauthorized discounts and control of free food orders is easy and automatic! selectable, changeable personal identification number. Whether one employee is responsible for their own drawer or bank, or a drawer is shared among several employees, Point of Success monitors every payment. Define the types of payments the restaurant accepts, then record each payment type. Drawer and bank open, close, and over/short reports print automatically. 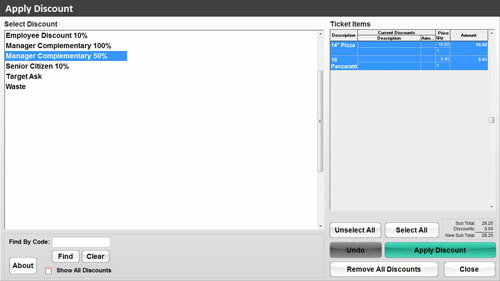 Prep tickets and kitchen monitor screens are easy to read, minimizing errors in order preparation. All the information the kitchen staff needs to prepare, track and complete an order is included right on the prep ticket or kitchen monitor. The kitchen monitor is available only in Point of Success Premium and requires a computer. . Indicates features available only in Point of Success Premium.